Local California Olives are naturally slow cured in a light salt brine for 12 to 18 months and hand stuffed with California Almonds. When traveling to California the Olive Pit is a must stop for my family. We stock up on all of our favorite olives and pickled garlic. They always have great gift ideas as well. 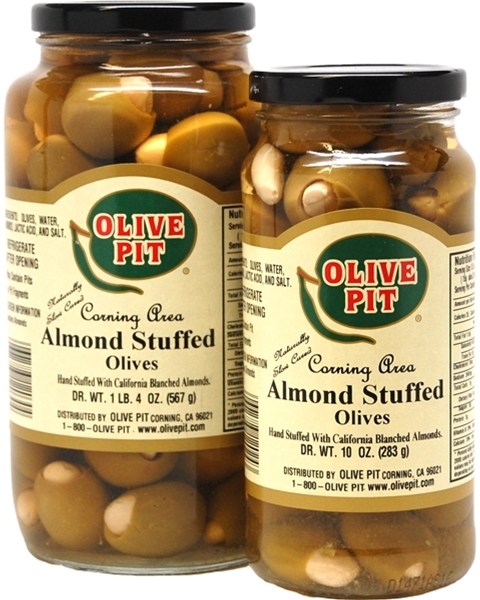 These almond stuffed olives are my favorite. They taste great! I have to thank my husband for introducing me to almond stuffed olives. He's the one who loves to sample. I was a little skeptical until I had one, and one more, and one more...you get the picture. These are delicious plus the almonds still have a bit of crunch. If you think I'm "nuts" ask for a sample to taste for yourself.